I don't know about you but articles about kitbashing buildings often look daunting. You need a fertile imagination and a keen visual sense to figure out where all those pieces will go. Put the back wall on the front, knock out two windows, cut off the cornice with a razor saw, assemble the shed back to front...you get the idea! The practical method is to photocopy the parts from a kit, glue the photocopies to cardboard, cut them out, and then assemble them with tape until you get the shape and look you want. The resulting buildings can stand in until the real model gets finished. You can even use colored pencils to fill in windows and other details and glue on brick or stone paper. I started kitbashing with Design Preservation Model (DPM) wall panels. DPM sells paper templates that can be photocopied. I'm not sure if this is kitbashing or scratchbuilding, but the result is your own creation instead of an "out of the box" kit. However, there's another way to get your feet wet as it were. Start with easy kitbashing of a scene instead of a building. I had an irregular piece of real estate at Mintwood beside a wye track on my former HO Utopia Northern model railroad. This area was near the entrance to the layout room so it was an excellent place for something eye-catching. 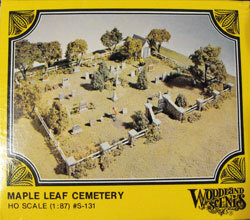 I happened to have a Woodland Scenics cemetery kit on my shelf that I bought years ago and never got around to building. The kit is designed for a rectangular area 11 X 8 inches. I didn't have that much free real estate. The kit instructions were actually for the Memorial Park scene. After I had hunted in the box for the cannon and the swing set I realized the wrong instructions had been included in the kit. This was just the push I needed to set out on my own. The picture on the box was a good guide. The first thing I did was to measure the space I had and mark it on the kit drawing. This showed me where to lengthen and shorten fences. I put down some basic grass and dirt scenery and then made and installed the side and rear fences. I drilled pilot holes in the scenery base (plaster over homasote) to set and stabilize the fence posts. I now had a defined area to work with.With kits like these it's best to paint all the parts before going further. I covered the drawing with wax paper so glue wouldn't stick to it and I wouldn't get paint all over it. I also assembled the little shack. I used some scrap stripwood to keep it from warping too much. 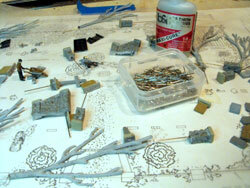 I primed all the metal parts with Floquil Gray Primer including the tree trunks. I then painted the tombstones and other scenic items with gray, brown, dirt, dust and concrete. This gave a variety of colors. I picked out individual stones on the stone pillars with different earth tones to provide a little variety. I used my Dremel and a small drill bit to drill holes in the bottoms of the pillars, wall sections and some tombstones and inserted dress maker pins secured with ACC glue. This helps to stabilize these items when placed in the scene. I cut off the heads of the pins with rail nipper cutters. From here on the easy kitbashing project is to put the scene together so the overall effect is pleasing without relying on the kit instructions. For example, I didn't set the stone walls in the same way as in the photograph on the box. Not did I follow the layout of the cemetery. This is a good way to ease yourself into easy kitbashing without following the READ ALL INSTRUCTIONS BEFORE BEGINNING mantra that most kit instructions begin with. As I worked at it my creative juices were starting to suggest what else I could add to the scene and what I might do with the other odd piece of real estate across the road. After installing the stone pillars I measured and fit the fence sections between the pillars. The front wall is shorter than called for in the kit so I used the extra pillars at the corners of the back fence. I scraped the ground cover down to the base coat of tan paint on the plaster and used Walthers Goo to secure the tombstones. I also dug a little hole in the homasote about a scale 8 feet long so I could have some figures working on a fresh grave. I made some trees with the material in the kit and planted them. The pins made this much easier to do. The final step was to carefully wet the area and secure everything with thinned white glue using a pipette. I sprayed the area with wet water (water with a drop of dish detergent) and covered the roads and the track behind the cemetery to avoid overspray. An alternative is to spray with 70% isopropyl alcohol to help the thinned glue to be absorbed by the ground cover. If you don't do this the ground cover will ball up into an unsightly mess. 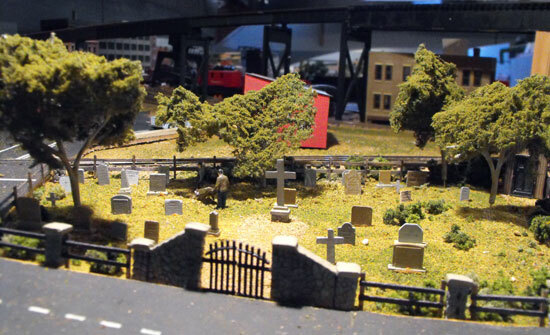 For now, here's the cemetery easy kitbashing scene as far as I took it. After I had completed the cemetery scene I felt it needed something extra to come alive (no pun intended). 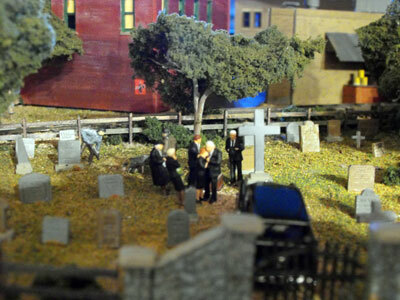 I added some figures and a hearse for a burial scene. Unfortunately, I had not built the cemetery as a diorama on its own base so I had no choice but to take it apart when dismantling this layout. The parts are now in a box. Hopefully I can find a place for it on my new Utopia Northern. It was such a neat easy kitbashing scene. Go from "easy-kitbashing" to other model train kit building. Return from "easy-kit-bashing" to my Home Page.